Finally. 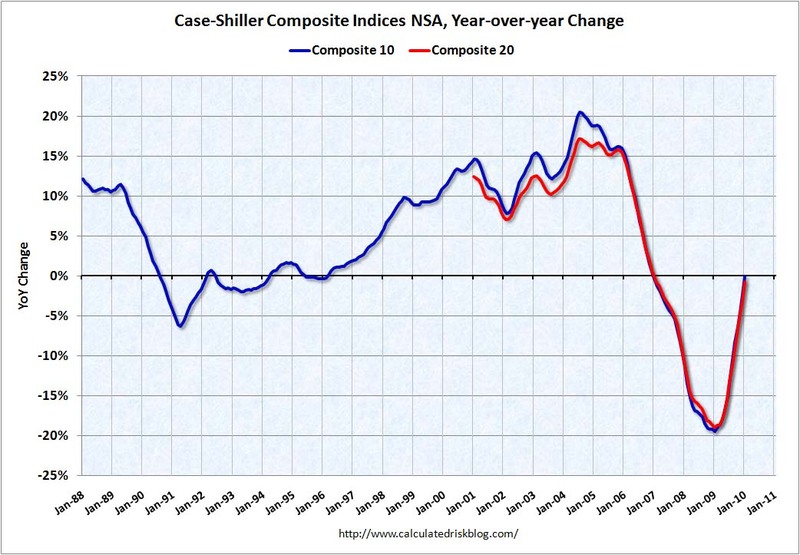 Every month the S&P website crashes when the Case-Shiller data is released. 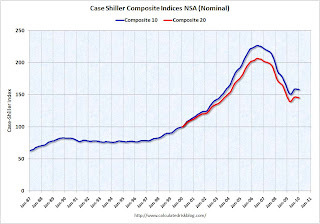 IMPORTANT: These graphs are Not Seasonally Adjusted (NSA). Unfortunately this month only the NSA data is currently available. Usually I report the SA data, but that isn’t available. 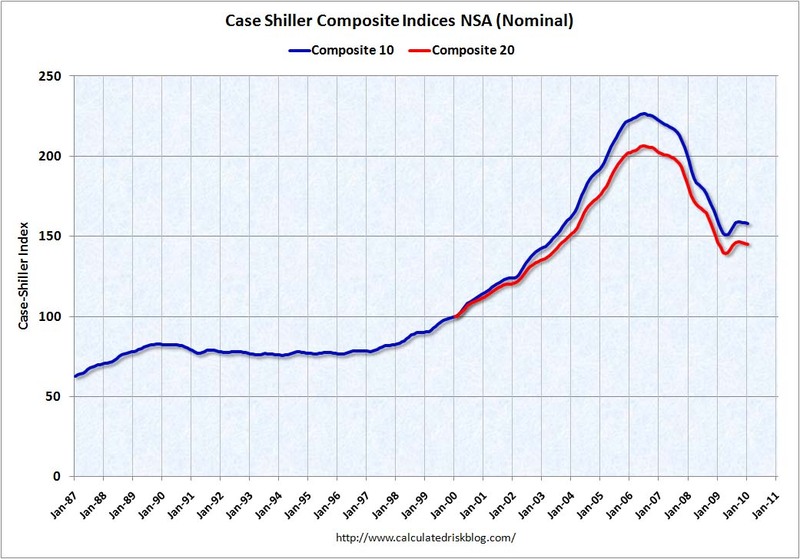 S&P/Case-Shiller released the monthly Home Price Indices for January (actually a 3 month average). The first graph shows the nominal not seasonally adjusted Composite 10 and Composite 20 indices (the Composite 20 was started in January 2000). The Composite 10 index is off 30.2% from the peak, and down about 0.2% in January (media reports are an increase seasonally adjusted – but that data isn’t available). 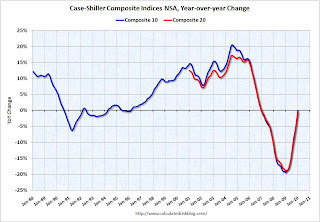 The Composite 20 index is off 29.6% from the peak, and down about 0.4% in January (NSA). The Composite 10 is essentially flat compared to January 2009. The Composite 20 is off 0.7% from January 2009. 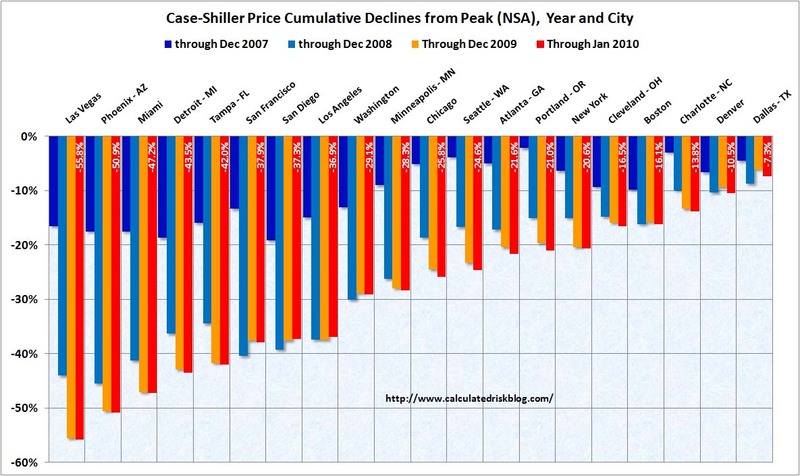 Prices decreased (NSA) in 18 of the 20 Case-Shiller cities in January NSA. Twelve of the cities in the index went up in January from December. Los Angeles was the biggest gainer, up 1.7 per cent. 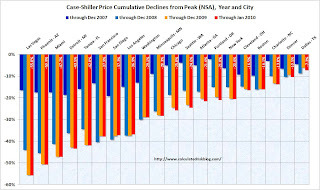 Chicago was the biggest loser, dropping 0.8 per cent. NOTE: Usually I report the Seasonally Adjusted data (see NY Times article), but that data wasn’t available. So remember these graphs are NSA.